You look younger, cuter and definitely happier in that second photo. Great before and after shots. Now, that is success! Look at you! That is amazing progress and you should be so proud. :) I'd rob banks for a neck and a tan... LOL. You look very healthy, very alive, and happy. Check out the tan! Oh, I wish the UK gave me a tan instead of making me whiter and whiter. I love this post, Mary! (Not because i'm mentioned on it - haha). 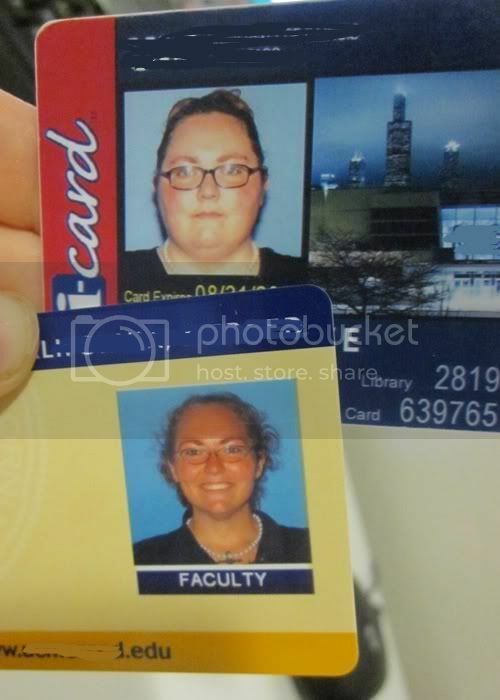 This post has made me look at my work ID and realise that it was also taken when I was around my heaviest weight. Maybe i'll post it on my blog one day. It is the worst picture in the history of pictures though. The difference is AMAZING--you look absolutely fantastic! How exciting to see that change! that's great and i LOVE that you're getting a new perspective on it. you should be proud and it's wonderful to hear you happy! I love before & afters. This one is now on my list of "the best ones." I love it. It reminds all of us, still on our long journeys, just how amazing the reward for our sacrifices really are. You look so, so good. Congrats on making it so far! You look amazing. I have just been introduced to your blog by a friend who is on the weight loss/transformation with me. Thank you for your candor and sharing. CONGRATS! Beautiful!!!! What an amazing transformation!! Congrats my Friend!! WOOHOOOO!!!!! I'm having trouble with my mind catching up to realizing who I am not. Glad to hear yours is finally doing so! What an awesome NSV. Someone's looking like quite the California girl. You look much happier in that second picture. I have a co-worker who said the same thing to me - and she is NOT French! LOL! Those pictures are amazing, that is for sure! You look incredible! Wowza! Huge difference! Your moth looks so tiny in the old picture, much more proportioned now! Thanks for sharing the pics! You look wonderful...and so happy!